The Eclipse Tools 9 in 1 Aluminum Handle Precision Screwdriver Set is a compact and portable screwdriver with interchangeable bits that can be carried around in your pocket. It features a hollow handle that stores nine bits of different styles and sizes, and a threaded cup that closes it. The precision bits are made of hard, durable, and corrosion-resistant chrome vanadium steel and come in Torx, Phillips, and slotted styles. The tip of the handle contains a permanent magnet to ensure a secure hold on the bits. The handle also features a find diamond-shaped knurling for a secure grip and a green anodizing finish. 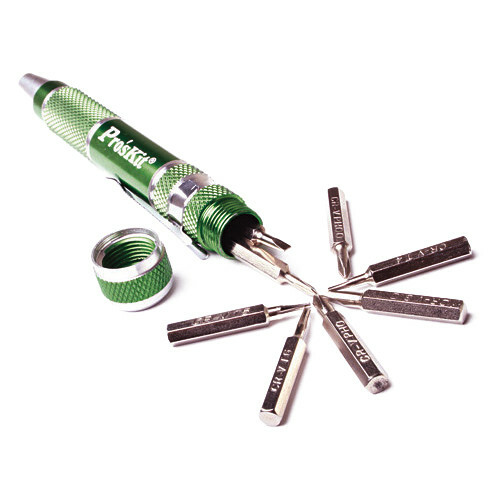 Box Dimensions (LxWxH) 6.4 x 3.6 x 0.6"
9 in 1 Aluminum Handle Precision Screwdriver Set (Green) is rated 4.0 out of 5 by 3. Rated 4 out of 5 by incrediblesax from very good Good tool. Rated 4 out of 5 by Thomas from A versatile and compact tool kit for servicing small devices I bought this tool some time ago, but only recently got a chance to use it. I had to change the battery in a fitness tracker. I found a suitable Phillips head bit among the Eclipse's suite of bits (it would be helpful if it included a Phillips #2 bit for larger screws). This tool's body design allows for quick removal and installing of screws without interference from the convenient pocket clip. The aluminum body is very light, but feels sturdy and has a knurled grip surface. The magnetic bit holder is convenient and effective, but not so strong as to make it difficult to remove these 4mm bits. The compartment for storing the bits is a little snug for storing all nine bits, as I prefer not leaving a bit in tool's tip, when not in use. The screw cap for the storage compartment felt a little gritty, when turning to loosen or tighten, but that will probably smooth out with some use. All in all, it's a nice tool and a handy addition to my gadget bag or a field tool kit. Rated 4 out of 5 by CK from Perfectly does the job Worked fine to replace the SSD in a MacBook air. Be aware that you also need an apple specific screwdriver to loosen the screws of the Macbook's housing. This is NOT part of this kit.